Scientists have long counseled against interpreting animal behavior in terms of human emotions, warning that such anthropomorphizing limits our ability to understand animals as they really are. Yet what are we to make of a female gorilla in a German zoo who spent days mourning the death of her baby? Or a wild female elephant who cared for a younger one after she was injured by a rambunctious teenage male? Or a rat who refused to push a lever for food when he saw that doing so caused another rat to be shocked? Aren’t these clear signs that animals have recognizable emotions and moral intelligence? With Wild Justice Marc Bekoff and Jessica Pierce unequivocally answer yes. Marrying years of behavioral and cognitive research with compelling and moving anecdotes, Bekoff and Pierce reveal that animals exhibit a broad repertoire of moral behaviors, including fairness, empathy, trust, and reciprocity. Underlying these behaviors is a complex and nuanced range of emotions, backed by a high degree of intelligence and surprising behavioral flexibility. Animals, in short, are incredibly adept social beings, relying on rules of conduct to navigate intricate social networks that are essential to their survival. Ultimately, Bekoff and Pierce draw the astonishing conclusion that there is no moral gap between humans and other species: morality is an evolved trait that we unquestionably share with other social mammals. 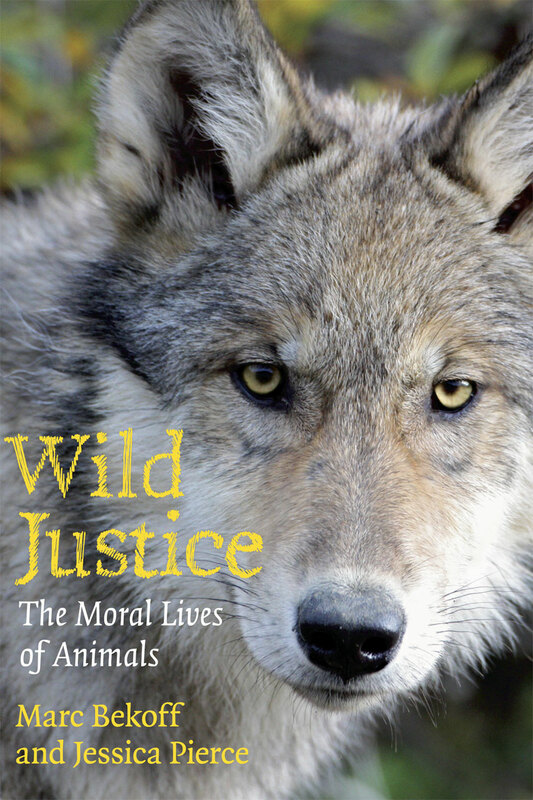 Sure to be controversial, Wild Justice offers not just cutting-edge science, but a provocative call to rethink our relationship with—and our responsibilities toward—our fellow animals. “As a child I learned that behaving fairly, during play with others, was a very important social rule. As a mother, I learned that treating my child fairly was key in building his trust and cooperation. And we find that fairness plays an important role in the social interactions of many different animals and is key in developing and maintaining friendships. Marc Bekoff and Jessica Pierce’s ideas about the moral lives of animals stress the significance of fairness, cooperation, empathy, and justice, aspects of behavior desperately needed in the world today. Read this book, share it widely, and incorporate its lessons into your classroom, family room or board room." "Humans think of themselves as the only moral animals. But what about the elephant who sets a group of captive antelope free, the rat who refuses to shock another to earn a reward, and the magpie who grieves for her young? Cognitive animal behaviorist Bekoff and philosopher Pierce argue that nonhuman animals also are moral beings—with not just building blocks or precursors of morality but the real deal. The research gathered here makes a compelling case that it is time to reconsider yet another of the traits we have claimed as uniquely our own." "Cognitive ethologist Bekoff and philosopher Pierce explore the moral lives of such commonly studied animals as primates, wolves, household rodents, elephants, dolphins—and a few more uncommon critters as well. . . . The authors contend that, in order to understand the moral compass by which animals live, we must first expand our definition of morality to include moral behavior unique to each species. Studies done by the authors, as well as experts in the fields of psychology, human social intelligent, zoology, and other branches of relevant science excellently bolster their claim." "Focusing here on the gentler side of animal natures, animal behaviorist Bekoff and philosopher Pierce discuss recent scientific studies documenting that great apes, monkeys, wolves, coyotes, hyenas, dolphins, whales, elephants, rats, and mice are capable of a wide range of moral behavior. They strongly urge the scientific and philosophical communities to recognize that these animals can act as moral agents within the context of their own social groups. This provocative and well-argued view of animal morality may surprise some readers as it challenges outdated assumptions about animals. The authors’ intention, however, is not to unseat humans from their moral pinnacle but to uplift our animal kin into the moral realm. Written as much for other academics as for interested lay readers, this lucid book is highly recommended for animal behavior collections in university and large public libraries." "Do animals feel empathy for each other, treat one another fairly, cooperate toward common goals, and help each other out of trouble? In short, do animals demonstrate morality? Bekoff and Pierce answer with an emphatic ’yes!’ in this fusion of animal behavior, animal cognition, and philosophy. The authors discuss the sense of fair play and justice in nonhuman animals. Social animals form networks of relationships, and these relationships rely on trust, reciprocity, and flexibility—just as they do in humans. Calling these behaviors morality, the authors present evidence that morality is an adaptive strategy that has evolved in multiple animal groups. Basing their argument for animal morality on published research (listed in the generous bibliography) and anecdotal evidence, the authors group moral behaviors into three clusters: cooperation, empathy, and justice, each of which is discussed in turn. A final chapter is a synthesis of moral behavior and philosophy, suggesting areas for further study and discussion. The conversational tone and numerous illustrative examples make this an excellent introduction to a new science." "One of the most fascinating--and readable--academic books of the year, this groundbreaking study gathers together some remarkable research about the way animals can show compassion and empathy and even have a sense of fair play." "As dense with information as this book is, it remains readable by nonscientists, and its philosophical implications reach far beyond scientific confines." "The authors write as though they are having a conversation with the reader. . . . This well-thought-out, provocative work will give scientific and lay readers plenty of examples to rethink and open new paths of research into the lives and minds of animals."